Note - this article was published in November 2011. The Measure of a Man: The Story of A Father, A Son and A Suit had only recently been released. Widely praised, the book was nominated for several awards. Since that time J.J. Lee has added the title of playwright to his resume. I looked high and low for some images from his childhood or from his time as a journalist/commentator at CBC, but so far no luck. In checking online sources, The Measure of a Man can be ordered from Chapters Indigo and Amazon. I would also check with your local bookstore. J.J. Lee connected to the fashion world when he was very young. 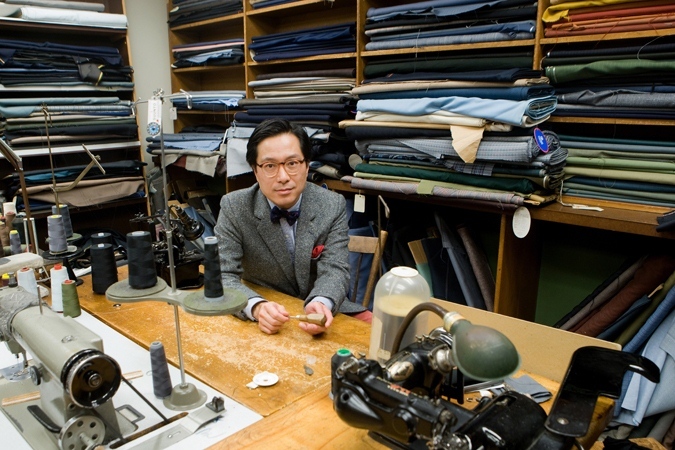 He used to visit his father's closet to go through the amazing collection of suits found there. “At the root of it all was my love for my father. I would drag the suits down and actually sleep on them. Smelling them and wrapping myself in wool is a primordial image for me.” It would be years before fashion returned to have a significant place in his life, but those early memories were the seeds. Although Lee was a typical teenager dressed in rugby pants and polo shirts, there was another side that loved to indulge in “...explosive moments of fashion. I had really interesting clothing from early on, but would get into it and out of it.” Wide pants legs were tapered and a pair of his sister's green jodhpurs appropriated. One Halloween he and his friends dressed as Miami Mice in white blazers, pastel shirts and mouse ears. He would peruse his sister's issues of ELLE magazine, especially those featuring Elle Macpherson, and even tailored his own grad suit. Lee quickly discovered he felt at home in the shop and soon developed a strong relationship with one of the owners, Bill Wong. He became a loyal customer and enjoyed hanging around, socializing and occasionally helping out. 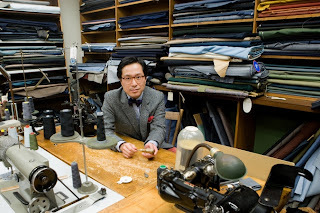 “If you spend any time there, you realize how beautiful the feel of the shop is and how wonderful all the fabrics are. I felt really at home with Bill, the rhythm of the shop and the kind of life it had. I thought why can't this be me? Why can't clothing be my architecture?” After five years he was offered an apprenticeship, but it soon became obvious tailoring would not to be his future. It ended amicably and to this day he still pops in to soak in the atmosphere and have lunch with Bill. All of Lee's experiences were distilled into an hour-long radio documentary combining the social history of suits, his apprenticeship at Modernize Tailors and memories of his father - a well-known, vibrant man who ran the legendary Kon Tiki night club in Montreal. His father was also plagued by alcoholism. The elder Lee suffered a long decline and his amazing suit collection would be reduced to one poor quality offering. In the program, the symbolism of Lee's journey to alter this last suit is used to tie together an examination of deep personal issues, his time spent as an apprentice and how this iconic men's garment has evolved over time. Interesting historical moments are covered such as when Hedi Slimane revolutionized the menswear over a decade ago. Editor Anita Chong of McClelland andStewart heard the CBC broadcast and tracked Lee down with an offer to turn it into a memoir. It took two years to bring this very personal book to publication. 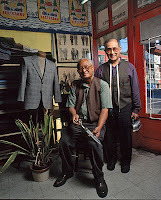 The Measure of a Man: The Story of aFather, A Son and A Suit hit bookshelves in September 2011. 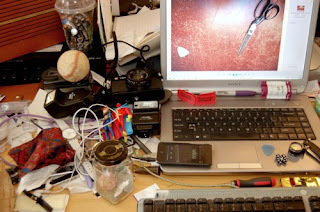 Love this image from his website of his writing space. For the future, Lee looks forward to again immersing himself in writing, but that will need to wait until the media frenzy for his current memoir has settled down. 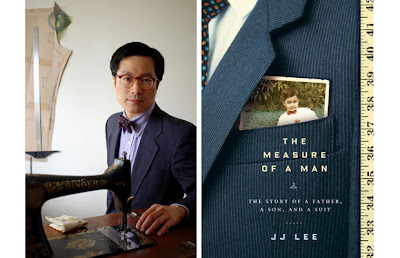 For more information on J.J. Lee or The Measure of a Man, please visit his website at www.jj-lee.com.